To learn how to access the college's research databases or enter your college login, go to How To Access Library Databases. As soon as you log in, you are at the Basic Search page. In the search box, you can enter your article title, author or the keywords you have chosen for your topic. Limit your search results to ones with full-text in this database. Be cautious about doing this because you might be able to find those articles in our other databases. Limit your search to peer reviewed (scholarly) articles. Limit your search to articles with images. This is useful if you're looking for a chart or graph or a photograph of a person, event or phenomenon. To get to Advanced Search, click the Advanced Search link in the orange menu at the top of the page. Pull-down menus at the far left let you choose to join keywords in those boxes with AND, OR or NOT. Keyword - searches the author, title, subject terms, and abstract. Entire Document - searches all of that, plus the full-text of the article. Subject - searches for your terms in the database's controlled vocabulary. For more information about that, see Controlled Vocabulary. You can limit your search to documents published within a certain date range. It is set to All Dates by default. The boxes where you put in the date range only appear once you click Before, On, After or Between. You can also search by document type. 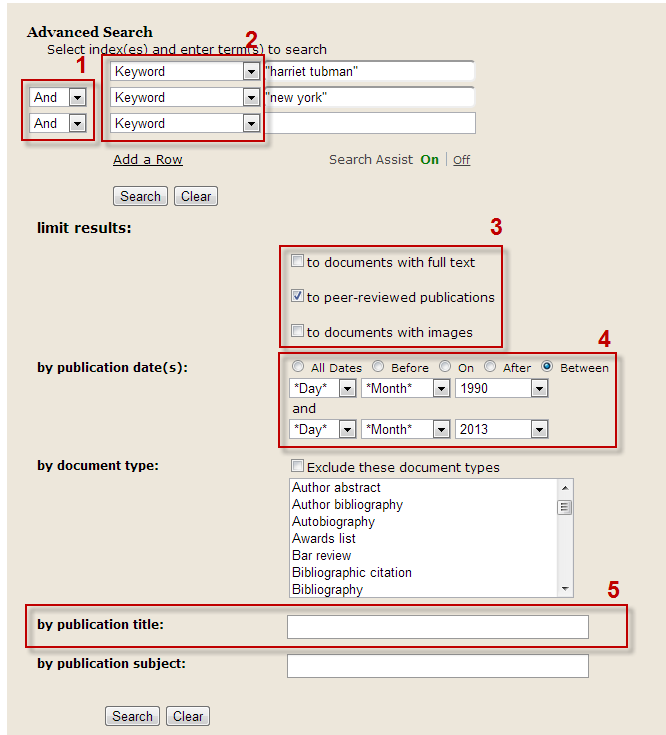 There is a special Publication Title search box at the bottom to use if you want to search the article title. The search results are in the big middle column and organized with the most recent ones first. If there is more than one page of search results, you can click arrows at the top and bottom of the page to go through the pages of results. At the top of the column on the left of the page, you can search within results and limit your results to only full-text, only peer-reviewed, or only documents with images. 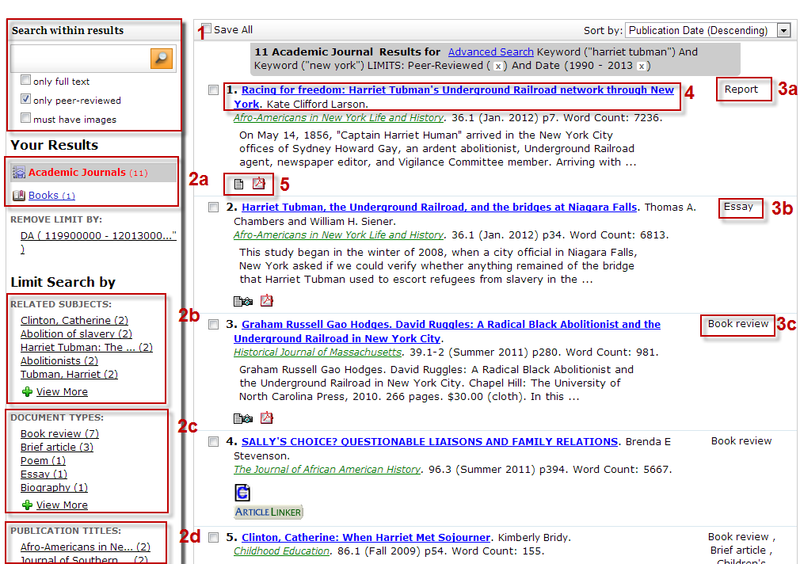 Underneath that, you have options to limit your results by subject, document type (article, book review, biography, etc.) or journal title. Click the title to get to the article information. To open the full-text article, click the tiny page icon (HTML full-text) or the tiny page with a red squiggle icon (PDF full-text). Click the PDF icon to view the article in a new window. Be sure your pop-up blocker is set to accept pop-ups from OneFile. From there, you can print the article or save it to your computer or a thumb drive using the icons across the top of the article. Not all of the articles have full text in this database, but many do.